NOTE: Includes TrueSurf Workstation software package. 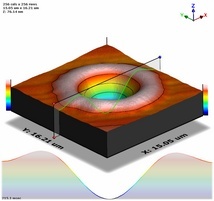 TrueMap software can visualize and analyze topography data from contact profilometers, scanning probe microscopy images, and laser topography instruments. Surface roughness filtering and parameter computation, hole volume, step height analysis, and 2D profile extraction are just some of the features of this powerful program. TrueMap has been disigned to work seamlessly with our TrueSurf profiling software for a complete surface analysis package. Over twenty five formats are currently supported and the list is growing fast. TrueMap has the capability to display surface topography data in a wide variety of styles. A few of the available user-definable parameters include color gradients, grid spacing, display mode, and contour lines. TrueMap also allows the user to interactively rotate, scale, pan and zoom the view of the data by simply clicking and dragging with the mouse, much like most CAD packages. TrueMap has support for over 25 file formats from various manufacturers of surface topography instruments including generic image formats such as bitmaps and jpeg files. More file formats are continually being added. Abbott-Firestone curve, material ratio curve, histogram for 3D surfaces. FFT, power spectrum, and autocorrelation analysis. Dynamic zoom, rotation, flipping, and inversion. 3D Spline and Gaussian filtering. Lowpass, highpass, and user-defined FFT filtering. Spatial filtering: Mean, Maximum, Minimum, Median convolution filters. 2D profile extraction (cross-section) in any direction. Smooth interaction with TrueSurf for further 2D profile analysis.